On cold weekend mornings there are few things better than waking up to hot coffee and a fresh homemade doughnut filled with cream. I know it's only Wednesday unfortunately, but I thought I'd brighten up your hump day by sharing the recipe for these powdery pink pomegranate doughnuts. I loooove doughnuts, as you may remember from a recent post, and my recent goal is to brighten this extremely dark world with fried dough recipes. Also thank you guys so much for all the love and comments on our kitchen renovation!! I seriously had no idea anyone would even care about it but was really excited with all of the positive comments. It's always scary to put myself out there online and to share things that I have been working on for a long time. This kitchen renovation was no different, so thanks for all of the encouragement. I shared everything with Kyle and he was super happy too. thanks!! I remember the first time I had a pomegranate, and it was at some girl's birthday party in middle school I think. I remember thinking I didn't really like it because of the seeds inside of each pomegranate aril, but now I love their juiciness, texture, and sweetness. I love to eat them as a snack or on top of winter salads. When I spotted these at the grocery store I was really excited and bought a bunch right on the spot. These doughnuts were a combination of my love for pink foods and pomegranate season. The pomegranate flavor isn't very strong in the pastry cream, but it does produce a hint of pink color which is super fun. I also dyed the sugar pink from the pomegranate juice which makes it looks like magical fairy dust if I do say so. I made my pomegranate juice the hard way by deseeding a pomegranate, blending all of the seeds/arils in a blender, and then straining it in a fine mesh strainer. You definitely don't have to do this, you can buy pomegranate juice at the store. 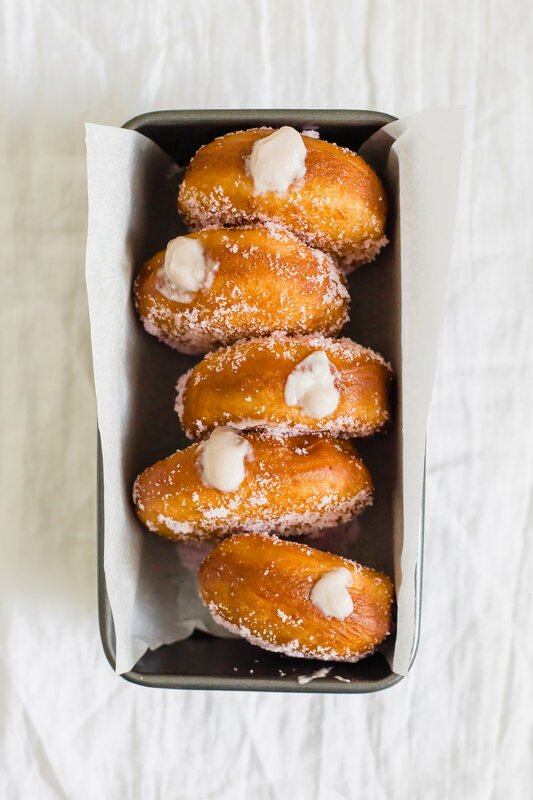 This is the same doughnut recipe I used for my cardamom yeast doughnuts that was also based off a New York Times recipe. It works wonderfully and if you are scared of making doughnuts, don't be! I believe in you. To make the doughnuts In a large bowl or liquid measuring cup, microwave the milk until warm but not hot. Sprinkle in the yeast packet, and let sit for 5 minutes or until foamy. In the bowl of a stand mixer fitted with the dough hook, combine the eggs, butter, sugar and salt with the yeast mixture. Add in 2 cups of the flour and mix until combined. Add in the rest of the flour (2 1/4 cups) and mix until combined and the dough forms a ball. The dough should become too thick to beat in the mixer. If the dough is still too wet, add in a little more flour (2 tablespoons at a time) until smooth. Turn dough out onto a lightly floured surface and knead a few times until smooth before shaping into a large ball. Transfer the dough to a large bowl that has been lightly greased with oil. Cover with plastic wrap or a thin towel and let sit at room temperature until doubled in size, approximately one hour. While dough is rising, make the pastry cream. To make the pastry cream, Heat milk, pomegranate juice, and 1/4 cup of sugar over medium heat just before boiling. In a small bowl, whisk together salt, 1/4 cup of sugar, cornstarch and vanilla. Add in egg yolks and stir until combined and it forms a paste. It's okay if there are clumps. Once milk mixture is hot, temper in a little bit (about 1/4 cup) into egg yolk mixture, whisking continuously. Slowly continue adding the rest of the milk mixture in, all while whisking continuously so eggs do not scramble. When mixture is fully incorporated with all of the ingredients, pour back into saucepan and heat over medium high heat. Stir the entire time until mixture thickens and is pudding-like in consistency. Strain pastry cream through a fine mesh strainer and into a bowl. Cover with plastic wrap, making sure to line plastic wrap right up against the surface of the pastry cream. Refrigerate for 2 hours or until chilled. Back to the doughnuts Punch the dough down and dump onto a lightly floured surface. Using a rolling pin, roll out until dough is 1/2 inch thick. Cut out the doughnuts with a 3 inch circle cookie cutter. Carefully knead any scraps back together and roll back out to make more doughnuts. Spread doughnuts out on 2 baking sheets and cover with a kitchen towel or plastic wrap. Allow to rise until doubled in size, another 45 min - 1 hour. Heat a large dutch oven or similar heavy-bottomed pot over medium heat and add the oil. Oil temperature should be close to 375°F. Get cooling racks or plates lined with paper towels ready to set doughnuts on afterwards. Using a metal slotted frying spoon or spatula, carefully add a few (2 -3 max) doughnuts to the oil. Don't overcrowd the pot. Fry for approx. 45 seconds, or until the bottoms are a deep golden color. Flip over and cook until the other side is golden. Transfer doughnuts to toss immediately in the pink sugar (simply stir sugar with a few tablespoons of pomegranate juice). Repeat with remaining doughnuts and set aside on a baking sheet lined with parchment paper. Transfer pastry cream into a piping bag. Insert the piping bag tip into the side of the doughnut and squeeze bag to release pastry cream and fill the doughnut. Slowly pull piping tip out of doughnut while continuing to squeeze filling out, and end with a swirl so there is a dot of pastry cream sticking out of the doughnut side. Repeat until all doughnuts are filled. These are best eaten the day of, but will keep until the next morning if kept in a sealed container.